A giant Canadian flag located the building of Themuseum, located in downtown Kitchener, was vandalized on Canada Day after an unknown individual climbed on top of the building and poured black paint or ink over the face of the flag. According to David Marskell, the CEO of Themuseum, black paint or ink was dropped over the flag with the banner draped over it conveying a message about resistance to the country’s 150 birthday celebrations. The Canadian flag has been in front of Themuseum since Feb. 28, and a banner which read “150+YEARS OF RESISTANCE #UNSETTLING 150” was hung in front of the flag on Saturday morning. 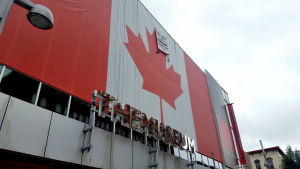 According to Marskell, over the past few months Themuseum has held a number of exhibitions and events, including the giant flag in front of their building, to celebrate Canada’s 150 years of confederation. Currently, Themuseum is hosting an exhibition called “A Cause for Celebration: First Things First”, which features four artists who explore the relationship between Canada’s 23 prime ministers and their relationship with the country’s Aboriginal communities during the first 150 years of confederation. On Saturday, Themuseum planned a citizenship ceremony where 21 candidates were sworn in as new citizens of Canada. The vandalism, including the banner and the black paint, occurred the night before. Once the banner was taken down, Marskell and the curator of the “A Cause for Celebration” exhibition agreed to add it to the actual show as part of their dialogue. The Canadian flag was also taken down for cleaning. “It’s actually what the exhibition is about – it’s about giving a voice to the Aboriginal community in Canada, to let people know what we have done in terms of being Canadian, and let Canadians of all ages process that and as part of that mission we’ve also had numerous sort of dialogues with speakers,” he said. Themuseum will also be holding a free event on July 12 that will address the incident and the issues surrounding it. Themuseum reached out to the Waterloo Regional Police Service, who are currently looking into the vandalism. “It’s in their hands for them to pursue and their choice for how they will go about it,” Marskell said.